Is Martyrdom Required a for Faith Ultimatum? When Given a Faith Ultimatum is Martyrdom Required? I love the story of Naaman in the Bible. He commands the enemy army, conducts raids into Israel, and even has a Hebrew girl as a slave. It’s this girl, full of faith and void of resentment, who suggests Naaman go to the prophet Elisha for healing of his leprosy. Despite Naaman’s complete unworthiness (sound familiar? ), God has compassion and wants to remove this disease. Though there are some twists along the way, God does heal him. However it’s easy to miss a small detail in the middle of the story. After he is healed, Naaman seeks forgiveness for something he knows he will do in the future, something he now comprehends as wrong. In the course of his service to his king, Naaman will have to go into the temple of Rimmon and bow down in worship. Naaman’s life will be on the line if he doesn’t. If he fails to kneel to this foreign god, he will be summarily executed. Today we hear stories of those fully committed to their faith in Jesus; they refuse to bow in worship to anyone but him. They stand firm and are summarily executed. They take a stand for Jesus and are martyred. I expect Elisha to tell Naaman to do just that, to affirm God as the only true god, to refuse to bend his knee, and to die for his convictions. Most martyrs have no control over their fate and are helpless victims of hate and opposition, but some have an option: affirm your faith and die or equivocate and live. 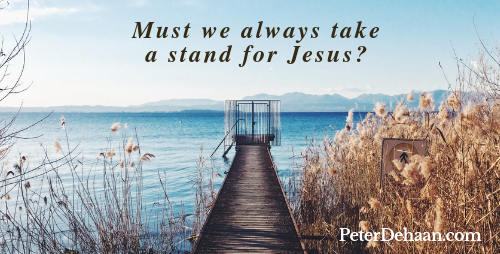 While we shouldn’t take this passage as permission to avoid taking a stand for Jesus if our life is at stake, we also shouldn’t conclude that God doesn’t allow for exceptions. Our response, if faced with such a situation, is for us to discern. May God grant us the wisdom to do so.